Where can I get additional guidance? When are e-mail messages records? You should treat e-mail messages the same way you treat paper correspondence. An e-mail message is a record if it documents JLAB's mission or provides evidence of a JLAB business transaction and if you or anyone else would need to retrieve the message to find out what had been done or to use it in other official actions. Do I have to manage incoming and outgoing e-mail as records? Yes, you should apply the standard described above to both incoming and outgoing e-mail. The reason is that both sender and recipient of e-mail messages have the responsibility to document their activities and those of their organizations. Both the sender and the recipient have to determine whether a particular e-mail message is a necessary part of that documentation. Are e-mail systems reliable enough for transmitting official messages? Yes, e-mail systems are highly reliable for transmitting messages. However, you should use e-mail for business only when you are reasonably sure that the message will not be altered after transmission. Consider the nature and sensitivity of the message, the technology involved, and the persons with whom you communicate when you decide to use e-mail for business. Are instant messages (IM) records? Yes, in certain circumstances. They are similar to e-mail messages; that is, if the messages are needed to substantiate your work, you must treat them the same way you would any e-mail record. You need to capture the text of the message, as well as who the message is to/from and the date and time. Also, due to the informal and sometimes cryptic nature of IM, it may be necessary to transcribe or capture the message in another format much as you would for a telephone conversation or other verbal communication if it is needed to document your activities. See also: NARA's Frequently asked questions about Instant Messaging. How can e-mail be an official record if it is not signed? A signature does not make something a record. Many types of records, such as manuals, reports, photographs, and maps, do not contain signatures, but they can still be records. 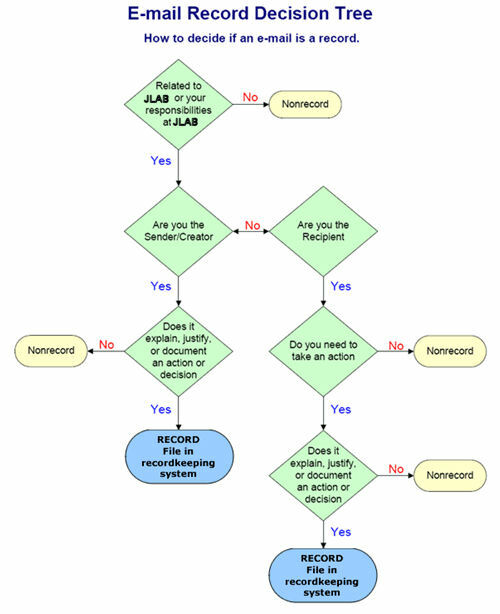 If an e-mail record is sent to several recipients, which copy is the official record? It depends. Different copies of the same message may be records. If you take any official action related to a message, and if the message is needed for adequate and complete documentation of the action, the message would be a record in your office, regardless of whether copies are retained elsewhere. If the record is in your office's official files, then your copy is not a record and you may delete it. If you receive a message only for information and do not take action related to it, your copy would not be a record. If I'm working on draft material, is it sufficient for me to save just my last draft? In some cases the last draft may be sufficient, and in other cases not. It is best to have the final version. Do these guidelines apply to sub-contractors? Yes, these guidelines apply to sub-contractors and other agents, as well as JLAB employees. Contract terms should ensure that contractor systems satisfy legal requirements for creating and maintaining adequate and complete records of JLAB transactions when those transactions are carried out by sub-contractors. Are there special requirements for retaining e-mail messages as records? if the e-mail system uses codes, or aliases to identify senders or recipients, a record of their real names is kept for as long as any record containing only the codes or aliases. For example, if you are communicating with someone via the Internet (e.g., researcher or collaborator), and their e-mail address does not indicate who they are (e.g., the address is JerryR@...) then a record must be kept of who they are. This might be done simply by always including their full name in the body of the message. Why is it necessary to keep the transmission data about the sender, receiver, date and time of the e-mail? You should treat e-mail messages the same way you treat paper correspondence. You would not delete the names of the sender and addressee, the date, or a time stamp from a letter on paper. The data identifying the sender and recipient(s), the time and date the message was sent, and, on the recipient(s) copy, the time and date it was received are equally essential elements that constitute a complete e-mail record. I'm using a distribution list for my message. How can I print the names of all the people on the list? Use "Save As" File. This will save the entire record, including the recipients names/email addresses. Once you have determined the message is a record and needs to be saved for the file, use the "Save As" file option, name your message according to your office procedures, and file in a network folder. What about attachments to an e-mail message? Do I have to keep them as well? Yes, you do. If a message qualifies as part of the documentation of your activities, you need to make sure that related items that provide context for the message are maintained as well. This includes attachments. You would keep them under the same conditions that you would if they were paper attachments to a paper memo or incoming letter. If my outgoing message is a record, should I ask for a return receipt to make sure that the person I sent it to got it? It is not necessary to ask for a return receipt or read receipt in e-mail any more than it is necessary in hard copy. We don't send all letters certified mail. If it is important to document for the record the time that a message was opened, then that receipt must be retained along with the message for as long as the message is retained. You also need to have some means of linking the receipt to the message so it is clear what outgoing message the receipt documents. Do I need to retain both the original message and the reply? The requirement is to create and maintain an understandable record documenting activities. Some replies to e-mail messages contain enough information from the original message that they can stand on their own, but most do not. The simplest way to ensure understandability of e-mail messages that will become part of the record is to incorporate the original message in any reply and maintain them as a unit. If e-mail is sent back and forth and the most recent message has the entire sequence of messages, you need to keep only the final message (including the previous messages and replies) as long as it also contains attachments and other data such as the sender, receivers, date, and time, that are necessary for a complete record. How long do I need to keep e-mail records? Retain e-mail records in accordance with your office's file plan and the DOE/NARA records schedules. The exact length of time will vary depending on the activity that the message documents. Retentions range from thirty days to permanent. What if the message does not qualify as a record? Delete e-mail that is not a record when no longer of use. Where do I keep e-mail records? enable transfer of those records which will not be destroyed to the National Archives. Does this mean that I need to print out all my e-mail messages? No. First of all, not all of your e-mail messages will be records. Second, if your organization has an electronic recordkeeping system to manage messages that qualify as records, the records should be maintained in that system. However, if no such system exists, print out the messages that qualify as records and file them in your organization's paper files. Can I keep the records in the e-mail system? No. Once you determine that an e-mail message is an official record, you should ensure that it is kept in an approved file system that satisfies the requirements for recordkeeping set out in points 1 to 5 above. You may, of course, retain your personal copy in your personal e-mail, but you must ensure that the record is placed in an approved file system. Can e-mail records be kept on backup tapes or disks? No, backups created to facilitate restoration of a system or file in case of accidental or unintentional loss are generally ill-suited for recordkeeping purposes. Do I need to retain both an electronic and hard copy for the same e-mail message? No, if you retain the entire record in either form, and it is properly filed in an approved file system, you do not need to retain both electronic and hard copies. Does FOIA apply to e-mail messages? Yes, e-mail is subject to the FOIA, and its release is subject to the same FOIA exemptions that apply to other agency records. What do I do about e-mail messages that contain sensitive information, such as classified, proprietary or Privacy Act information? If you receive e-mail containing sensitive information, apply the same standards and precautions to the e-mail containing sensitive information as you would to the same information in any other medium. However, you should not use the e-mail system to transmit messages that contain confidential business information, information covered by the Privacy Act, or other sensitive information. At the time of this writing, e-mail systems are not considered as secure or private as the U.S. Postal Service, and don't have the same legal protections.